The Santoku knife has a blade thinner than the traditional chef's knife, which gradually rounds off at the end to create a simpler edge. Thanks to the recesses on the blade during the cutting, small air pockets are created to prevent sticking of the cut products to the knife. 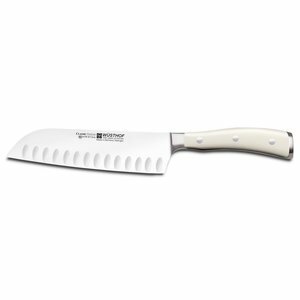 The Santoku knife is perfect when cutting into thin slices of meat and fish. 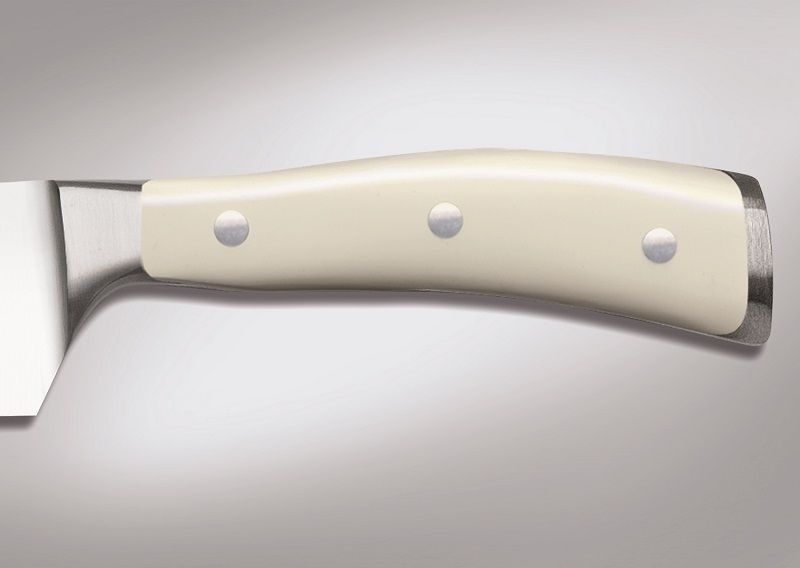 Thanks to the subtle, creamy handle, the CLASSIC IKON CREME series knives are characterized by all the advantages of the CLASSIC IKON series products, additionally becoming undeniably eye-catching elements of every kitchen. The handle is made of a synthetic material, previously riveted, without weld joint meets the highest standards and allows you to easily keep the knives clean. Thanks to the innovative geometry of the blade (beard) knife and the ergonomic, shaped shape of the handle, the knife is perfectly in the hand and is user-friendly. The blade is extremely sharp and remains so for a long time. Thanks to the perfect craft, cutting, chopping and cutting with CLASSIC IKON CREME knives is a real pleasure. Knives can be washed in a dishwasher, but it is recommended to wash by hand. WÜSTHOF knives are a synonym of the highest quality and as such they are to serve the users for the longest time while maintaining their properties. Therefore, remember to wash them immediately after use in warm water using gentle washing agents and then carefully dry them. Technologically, almost all WÜSTHOF knives are dishwasher-safe (with the exception of knives with wooden handles of the IKON line). We recommend, however, manual cleaning, because during washing in a dishwasher the knives are exposed to certain factors that may affect their lifespan. During the cycles of the dishwasher's operation, the blades may collide with each other, food remains such as spices, juices or sauces may have an adverse effect on the steel. Also unsuitable detergents may cause corrosion of components.